At Christmas The Hubs decided he wanted to get T a Stretch Armstrong, he thought it would be nice for T to have some of the toys from his childhood. Stretch was a bit hit and very popular when T received it and the fact that he has the same toy as Daddy had was very exciting to him. T plays with his Stretch all the time so what more does a boy need for his Stretch Armstrong than his nemesis, Vac Man! Vac Man is made of a very strange rubbery material and is full of tiny beans, when he's not had the air vacuumed out of him, he's quite floppy and loose, he comes complete with his own pump which you pump 6 times to remove the air from him. T managed to do this alone with no trouble at all, the only problem I had was stopping him pumping too much! Once the air is out of him he becomes very bobbley and you can then stretch him up to 4 times his original size!!! I'm not sure we've quite managed that yet but we've certainly managed to increase his size! 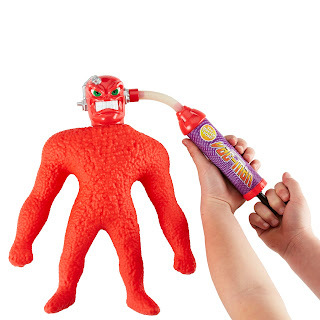 Vac Man is suitable for ages 5+, retails at £29.99 and is available from Character Online other characters including Stretch Armstrong, Fetch Armstrong and Octopus are also available. Disclaimer: we were sent this toy in return for our honest review. All words and opinions are our own. I've not seen a toy like this before, it's so bizarre. I can imagine little ones having a great time with it though. Wow what a really cool toy! I've never heard of vac man before, but it's an innovative idea for sure, and sounds like loads of fun! My son saw Stretch Armstrong on tv yesterday and wanted him, then he saw an advert for Vac Man and said I could have Stretch and he would have Vac Man. We will have fun, eh!! Good review, just let hubby know as I had forgotten about it. The toy looks great. My son would love this for sure. I've never come across a toy like that but it looks fun. And how clever that your son managed the pump all on his own!